“You don’t get a job solving math problems. You get a job solving human problems using math,” says Prep’s STEAM Coordinator Nick Ponticello. Persistence and self-directed learning are as essential as collaboration in today’s workforce, and Ponticello likes to say that the STEAM initiative is about “showing your work,” not just presenting the right answer. The philosophy behind the program is that, through an integration of science, technology, engineering, art and math, students are encouraged to think in new ways to solve real-world problems. Shane Frewen is the Deputy STEAM Coordinator. STEAM at Flintridge Preparatory School engages students and faculty in iterative design, student-driven discovery and interdisciplinary innovation by providing the tools to tinker and explore, empowering students to forge creative solutions to real-world problems both in and out of the classroom. The STEAM program has both curricular and extracurricular elements. In the classroom, teachers are free to design assignments and are encouraged by the school administration (as well as the school’s block schedule) to have students work on long-term projects that span the science, math and arts curriculum. For example, physics teacher Reid Fritz conceived of a demonstration that integrated art to demonstrate a physics concept—he worked with art teacher Melissa Manfull to construct a paint-filled pendulum to create designs that can be predicted and calculated. A woodshop activity during the block schedule was designed to help interested students develop basic assembly skills, while a 7th grade algorithmic thinking class teaches students the basics of logic necessary for advanced programming. A 10th grade art assignment created by photo teacher Ricardo Rodriguez asked students to design a box. Students used the CNC router to carve the design, assembled and stained their boxes and included their own photos describing the human condition alongside a single meaningful object. Tenth grade English students contributed poems based on the photos, as well. The projects were on display at the STEAM & Service Fair. Sandbox Robotics: This is a space for beginners and experts alike to tinker with robotics in a low-pressure, non-evaluative environment. FIRST Tech Challenge Robotics Team: This club competes against schools throughout the greater Los Angeles area in creative robotics challenges. Girls Who Code: This club is for girls who want to program. Its aim is to boost female interest in STEM fields. The group does hands-on projects serving real-world purposes along with having periodic talks with local female alumni in the STEM community. Programming Club: Students meet once a week to discuss programs they are working on at home; they solicit advice from their peers on how to improve their programs. Science Club: Students meet to perform science demos and experiments and to discuss recent scientific discoveries. Science Olympiad (High School): Students compete with other schools in the greater Los Angeles area in science and engineering activities and content knowledge. 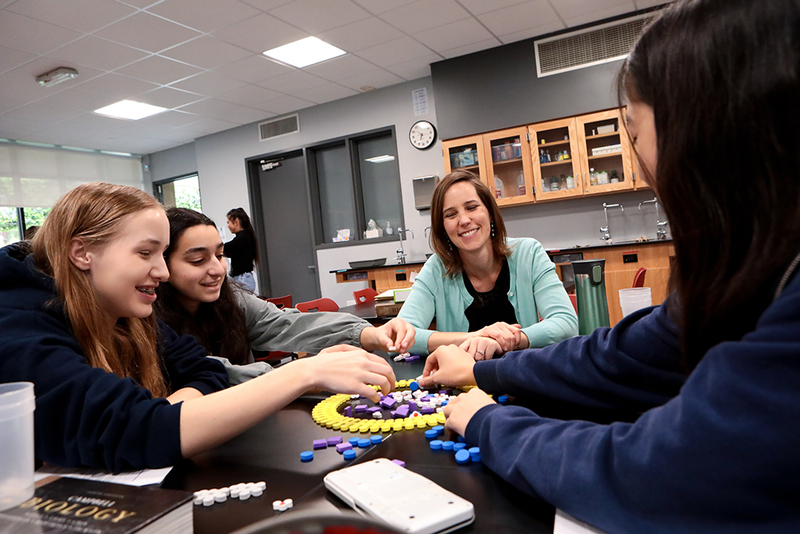 Science Advisory Committee: Students on the science committee aim to foster the scientific community at Prep by spreading interest and promoting involvement in science. STEAM Community Block Workshops: Prep engages middle and high school students in STEAM workshops like woodworking, laser cutting, 3D printing and more during our weekly Community Blocks. Math Club: Students prepare for various national and regional mathematics competitions including: the AMC 12, the Mandelbrot Exam, the National Mathematical Talent Search, Purple Comet, Who wants to be a Mathematician, Math Madness and more.